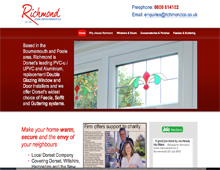 Richmond Home Improvement prides itself in supplying the best double glazing in the Bournemouth, Poole and Christchurch area. The Dorset based company offer a range of services allowing customers to save on energy bills through their various upvc glazing products. Richmond have a wealth of experience in fitting double glazed doors and windows, conservatories, guttering and fascias. As well as supplying residential UPVC and composite doors in Poole and Bournemouth Richmond Home Improvement Co. offer a wide range of supply and installation services which include providing commercial double glazing across Dorset and helping landlords with replacement double glazing for flats. Richmond Home Improvements also provide professional double glazing repairs to existing windows and doors. A range of problems that can occur such as misted windows, misted double glazing, double glazing condensation, and window seal repairs can be repaired by Richmond Home Improvements. Richmond can quote on all UPVC window repair services which can provide a lower cost to the customer than new window replacements. If you are looking for coloured upvc doors in Dorset, wood grain effect UPVC windows or doors in Bournemouth or commercial double glazing in Dorset contact Richmond Home Improvements for more information or a quotation.